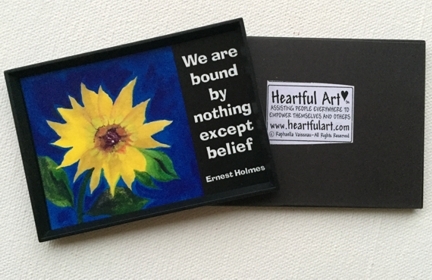 Magnet, poster, or print of an Ernest Holmes quote, "We are bound by nothing except belief" with sunflower art by Raphaella Vaisseau. This quote is a motivational reminder of the importance of belief, which, together with desire, are two ingredients of manifestation. If you are a student of the law of attraction, this one's for you. Believe. Know. Look within. Focus on what you want more of. Watch what happens.